"It seemed the game had drawn a lot of attention within Nintendo"
This piece appears in full in John Szczepaniak's Untold History of Japanese Game Developers: Volume 2, and is republished in part with kind permission. This interview signifies how unpredictable journalism can be. 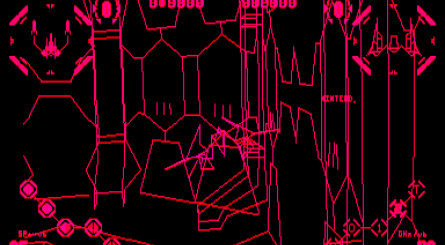 I was sitting in the Agatsuma office interviewing Yasuo Nakajima, and the conversation moved to the Virtual Boy and Red Alarm, two topics which had always fascinated me. Suddenly he mentions he has the business card for the lead programmer on it - Mitsuto Nagashima - leaves the room, and returns with a photocopy. Although I didn't have time to visit and interview Mr Nagashima in person, I did ask several rounds of questions via email. My translation wingman for this chapter was Casey Loe, who I hired, and who was interviewed in Volume 1 for his work on Suikoden II. John Szczepaniak: You Joined Xtalsoft which was later merged with T&E Soft. What did you work on? 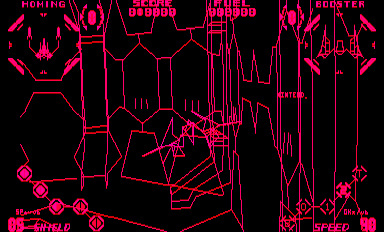 Mitsuto Nagashima: It was right around the time that the company started discussing the possibility of making a space shooter for the Game Boy - as I was something of a shooting specialist at the time, it would be the perfect project for me. But why would we make a shooting game when the industry was going through a major RPG boom? Looking back on it now, I wonder if the company decided to pursue a project in my genre of expertise specifically as a confidence-builder for me? The game was Chikyuu Kaihou Gun ZAS. I put in every trick I could come up with, using the Game Boy's hardware in clever ways, like making parallax backgrounds that utilized the ghosting effect of the liquid crystal screen. I consider the game to be my masterpiece. (I know I'm singing my own praises here.) I'm sure you'll agree after seeing the videos that the game had unusually impressive graphics by Game Boy standards. Those were drawn by the close friend I met at technical school, and it was thanks to him that I was able to realize my ideas in so stunning a fashion. 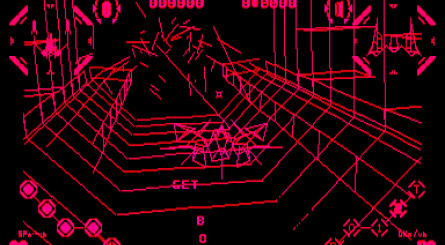 JS: How did T&E become so involved with the Virtual Boy? MN: At that time, there already seemed to be a lot of enthusiasm for developing three-dimensional shooting games within the company. T&E vice president Eiji Yokoyama went to Nintendo to see the technology, and came back saying, "We could probably do a wireframe 3D shooter." When president Toshiro Yokoyama heard that, he apparently gave it a green light on the spot. That sort of decisiveness was one of the things I admired most about T&E Soft. JS: What was the VB prototype like? MN: The next day, my boss Nakatsuji-san and I had a chance to go to Nintendo and see a prototype version of the hardware. 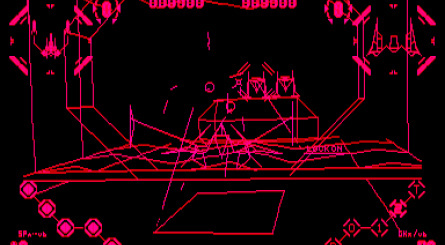 The first Virtual Boy I ever saw was what looked like a handmade black box with two square eyeholes cut into it. When I looked through the holes, everything was red. 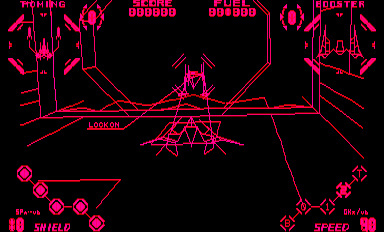 I remember seeing a demo of a polygonal bird flying around. 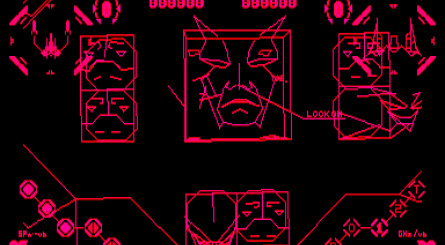 When I asked the developer why it appeared to be in three dimensions, he explained that there was a different screen for each eye so that they could project a different image to each. I remember thinking that if that was all there was to it, we should be able to pull this off. 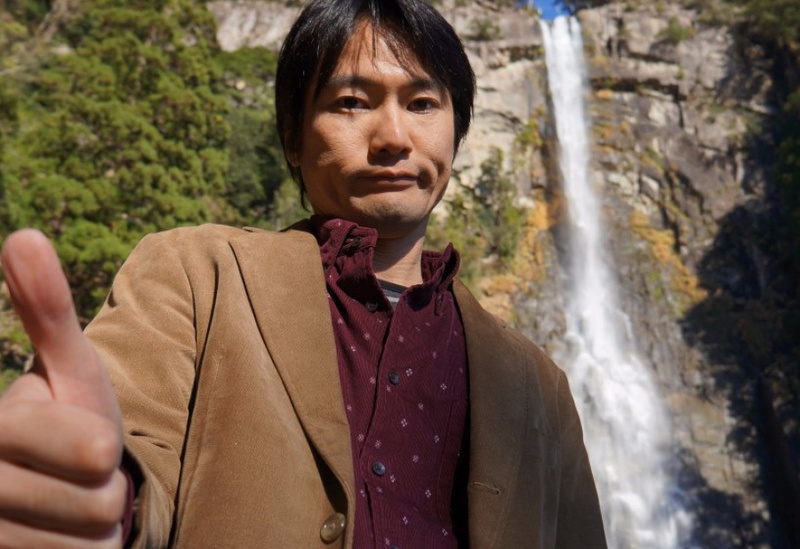 Afterwards, we talked with the lead developer [Gunpei Yokoi] who made a passionate case for the Virtual Boy, saying things like, "A game doesn't need colour to be interesting," and "3D will open up all sorts of new possibilities!" At the time, the PlayStation had just released and we were seeing polygonal games that offered impressive graphics, but little in the way of new experiences. Having grown tired of seeing the same sorts of games over and over again, his words really resonated with me. JS: So you were coder and planner? MN: At the time, it wasn't unusual for a programmer to adopt the role that we would call "game designer" today, and determine what sort of content would go into a game. In my case, I was in charge of the game's content, balance, enemy positions, and even parts of the story. JS: I assume Nintendo provided T&E with special equipment? MN: Shortly after our meeting a development kit arrived at our office. It was almost identical to the one we saw at Nintendo. I don't remember exactly what it looked like, but I believe the unit was the size of a small desktop computer, with that black box connected to it by a wire. It came with a number of demos, and I remember how excited I was to be playing them at my desk. In the latter half of development, the black box was replaced with the now famous red visor unit. JS: As a programmer, can you describe how the VB worked? MN: I went straight to work investigating the parallax displacement between how the image of an object appears to the left eye, versus the right eye. 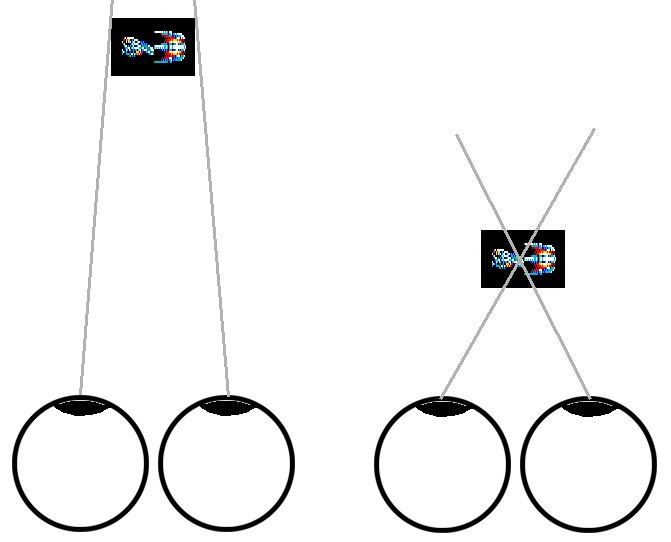 In theory, the closer the sight lines are to parallel, the more distant the object should appear, and the closer the sight lines cross, the closer the object should appear. So I placed a character against a black screen, and applied the parallax displacement to make it seem closer. "Huh...?" Then I tried to make it seem farther away. "What the...?" That's strange. Nothing happened. Maybe I need to try to make it seem even farther away...? "Huh...? What is going on here?" MN: Assuming I had done something wrong, I placed two objects this time, but only applied the parallax displacement to one of them. This time it worked perfectly, and I was able to make the object move forward or backwards in just the manner I had predicted. Can our eyes not perceive 3D without other objects for comparison? Can we not perceive distance on a single object alone in the darkness? It would explain why I couldn't perceive the object as being distant in the earlier test, and perhaps when I tried to make it seem closer or further away, I just ended up causing my eyes to cross or become whatever the opposite of crossed is. Wow, could I cause people to cross or reverse-cross their eyes at will? That's kinda scary! JS: How did development of Red Alarm go? MN: Now that I had the 3D effect working, I wanted to do something that could only be done in 3D. I wanted to be able to fly freely in 3D space, going forwards, backwards, up, down, left and right... 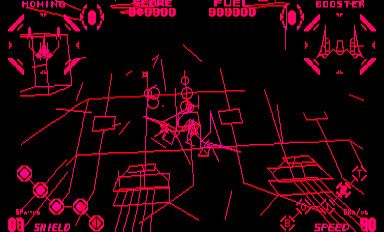 But the company's leadership wanted a game that was more like Namco's Starblade, where the game scrolls automatically, and the player aligns a reticule over foes to shoot them. 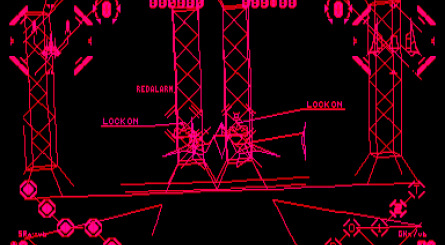 Designing controls for flying freely in space is complicated, and I don't think they believed we could pull it off. 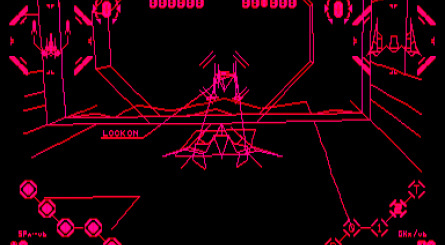 It's certainly true that there weren't many games of that era that allowed for free flight, and even a small misstep could leave you with a game that felt like a flight simulator. And then you end up with a control scheme where reorienting your ship to dodge an enemy bullet fired from close range becomes nearly impossible. While we ere developing the game, Nintendo was still internally debating what form the controller would take. I had heard the Yokoi-san wanted a second D-pad on the right side of the controller, and I was convinced that since he wanted this, it would happen. Fortunately, it did. JS: What were Nintendo's reactions as development progressed? MN: Just as we were battling with all these issues, people started talking about E3. 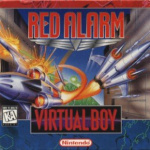 Nintendo was planning to show the Virtual Boy at E3, and apparently wanted a demo of Red Alarm to show along with it. Naturally, we were grateful for the opportunity, and began developing an E3 demo alongside the actual game. We periodically brought new versions of the demo to Nintendo, and after playing one, Yokoi-san remarked positively, "When playing, you completely forget it's all just lines." I was deeply flattered. One member of Nintendo's development team said that whenever we brought a new demo, around 50 people would come to play it. Assuming it was lip service, I said, "Oh, come on," but he said "it's true" with a straight face. It seemed the game had drawn a lot of attention within Nintendo. JS: So how was the reaction at E3? A few days later, when I brought the final demo to Nintendo, I finally had a chance to ask what President Yamauchi had decided. They said his only comment after seeing Red Alarm was, "I don't know. You guys can decide on this one." Thanks to a push from the rest of the staff, it was decided that the game would be shown after all. JS: What are you currently doing? Any future plans? I think I'll continue working on smart phones for a while. Not just making games, but whatever I feel like making. MN: People who harshly criticize our work are valuable and necessary. Sometimes I think their opinions are off the mark, and then much later something happens that makes me realise, "Ah, this must be what they were talking about!" It's important to select the useful pieces from the feedback you receive, and let them influence your work. That said, it's just as dangerous to rely too much on the feedback of others, and lose sight of what you had wanted to achieve. You need to be able to merge their opinions with your own goals in a balanced way. That's a lesson I've learned the hard way, by losing sight of what I wanted and paying the price for it. Thanks for reminding me I need to order that book. Name inspired by "Red Alert" by any chance? 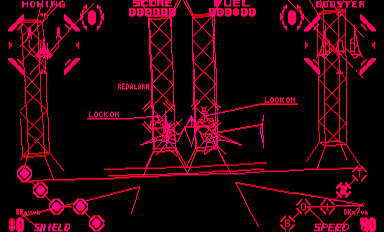 Still wish they'd bring Virtual Boy titles to 3DS VC...come on Nintendo, you're leaving money on the table! 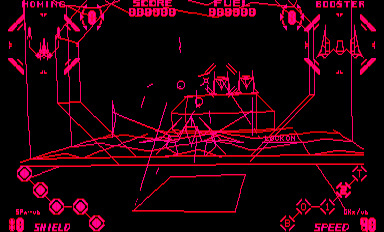 I never bought a Virtual Boy (I didn't have enough money as I was 10) but I did think Red Alarm was pretty awesome from playing it in stores. Star Fox 64 was like a realization of the potential I saw in this game. I love this game! It's probably my favorite VB game. The interview being cut at the E3 reveal seems anticlimatic. 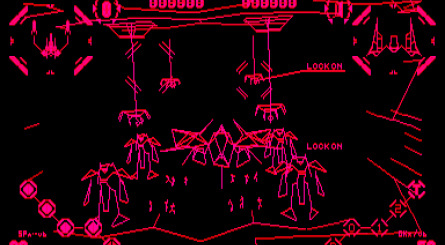 I was expecting some more insight on the actual release of the game, sales expectations and realities, or how it felt for a developer that made what is easily one of the best virtual boy games to see the system infamous first and only year at the marketplace, and the knowledge aquired to develop in such a specific piece of hardware going to waste. 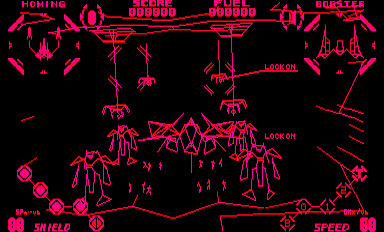 Defintely my favorite original Virtual Boy title, love this game. @bofis I second this motion. 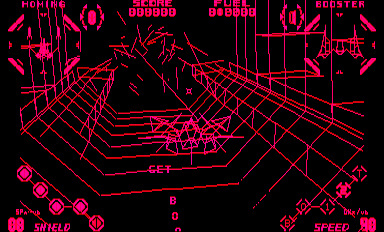 I would love to download Virtual Boy games on the 3DS. @bofis "come on Nintendo, you're leaving money on the table!" You know this system is barely knew, except by the geek/otaku disphoria and it was a huge failure right? 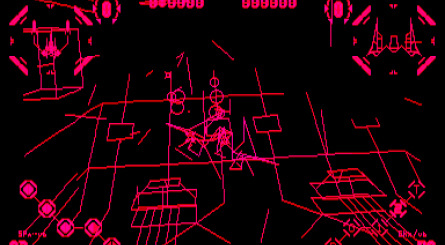 I'd love a remake of Red alarm... maybe in color so I can see the walls. That's actually pretty funny. 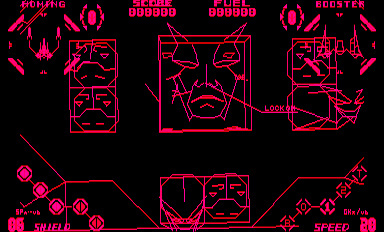 I had no idea that the Virtual Boy could have the potential to make people cross or uncross their eyes. @bofis The 3ds likely doesn't have the processing power to emulate the VB effectively. It's likely the reason why even SNES isn't on it, and that doesnt require as much. @Discostew Well, if that's the case, and it may very well be, I wish somebody would just say that's the reason. Personally, I think it has enough power to emulate VB and SNES.